The uric acid test measures the uric acid blood level. The urate blood test measures the uric acid blood level. Why is a urate blood test important? The uric acid test screens for elevated uric acid levels and helps evaluate gout and other problems. This Uric Acid Test is a blood test. The uric acid test, also known as a urate blood test, uric acid lab test, and gout lab test, measures the uric acid blood level. Uric acid is a molecule also known by its other forms - urate and acid urates. Made from carbon, hydrogen, nitrogen and oxygen, uric acid is normal product of the breakdown of cells (specifically purine nucleotides) via the enzyme xanthine oxidase. Most uric acid is filtered by the kidneys and excreted in the urine. In human health, high uric acid levels, also known as hyperuricemia, can cause issues in the body. Elevated uric acid blood levels result from increased dietary intake of meat, alcohol and sugars. High uric acid levels can also occur in the setting of high cell turnover states, decreased kidney function, and use of specific types of medications such as diuretics. The common consequence of high uric acid levels is gout, a condition in which the uric acid normally dissolved in bodily fluids forms crystals in our joints and skin. Gout is quite painful and symptoms can also include red or hot joints. Gout is typically managed with lifestyle changes as well as medications such as NSAIDs, colchicine and allopurinol. High uric acid levels may also be associated with kidney stones, insulin resistance and metabolic syndrome. To get a uric acid test near you, just order online and get your blood drawn at the selected Quest Diagnostics lab. 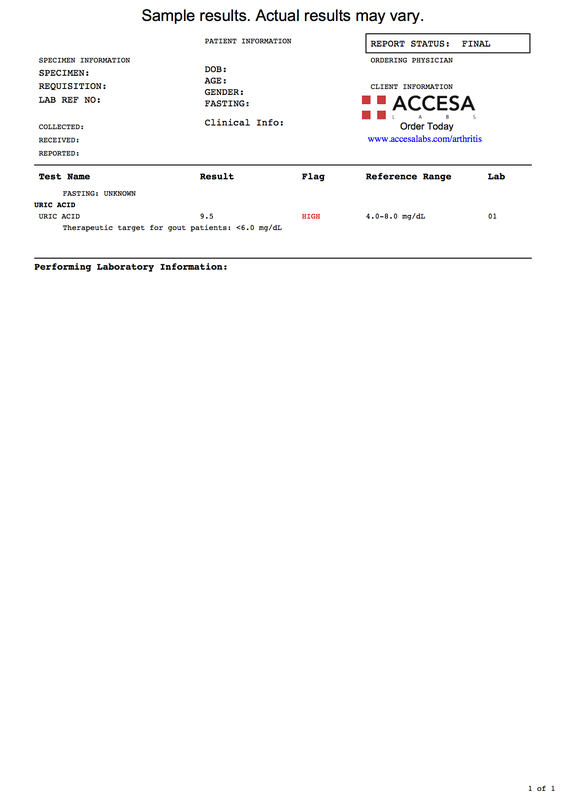 Once your uric acid lab results are ready, you will be able to download them electronically. As can be seen on the uric acid sample report above, your uric acid blood levels will be reported in mg/dL as a numerical result. The uric acid lab report will also include a reference range against which you can compare your uric acid lab test results. The urate blood test is a component of the more detailed joint pain panel. Uric Acid Test at Guaranteed Prices.